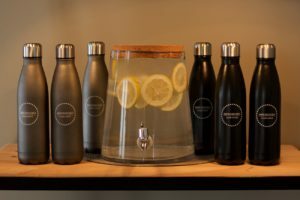 Mhondoro Safari Lodge has taken the lead as one of the first luxury game lodges to eliminate the use of plastic water bottles in support of Braam Malherbe’s DOT Challenge. Located in the Welgevonden Game Reserve in Limpopo province, the 5-star lodge has invested in a water purification plant that produces drinking water fresh from the surrounding Waterberg mountains. In guest rooms plastic water bottles have been replaced by glass bottles, while each guest receives a personalised aluminium water bottle that can be refilled with fresh, purified water for game drives, and to take along on their return journey home. Extreme adventurer, highly respected inspirational speaker and conservationist Braam Malherbe conceptualised the DOT Challenge to connect like-minded individuals on a global scale and to encourage every human being to Do One Thing to protect and preserve our planet. Mhondoro’s entire operation is based on sound environmental conservation practices and it is committed to making a contribution in each of the DOT Challenge categories – water, waste, conservation and energy. All excess waste is 100% recycled, including glass, cans, paper and food. Organic material is composted and used in the lodge’s kitchen garden where up to 45% of the fresh produce used in the restaurant is organically grown. Other game lodges are challenged to join the #DotChallenge #NoPlasticH2OBottles challenge and ‘Do One Thing’ to help make a positive impact on our environment.